A bitter divide over who is to blame for scores of Palestinian deaths from Israeli fire at protests near Gaza’s border shifted Friday to the United Nations, where the United States vetoed a measure backed by Arab countries to protect Palestinians and condemn Israel. Nikki R. Haley, the American ambassador to the United Nations, described the measure, a United Nations Security Council resolution drafted by Kuwait, as one-sided. She accused the measure’s authors of inexplicably absolving Hamas, the militant group that controls Gaza and organized the protests. The United States, a permanent Security Council member with veto power, was the sole no vote on the measure, which was enough to defeat it. Ten members voted in favor and four abstained. 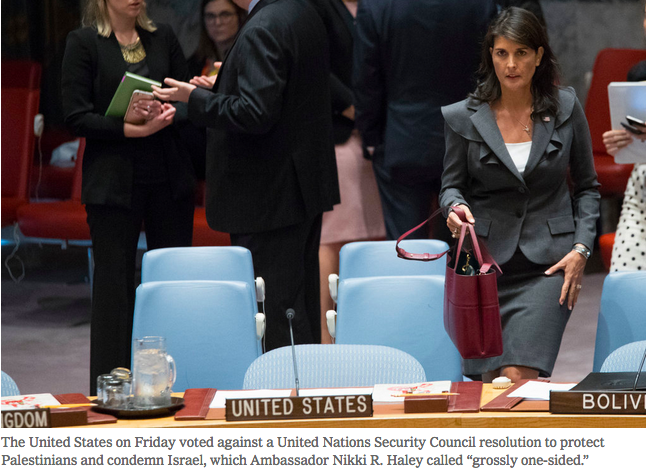 A separate American resolution proposed by Ms. Haley, which would have condemned Hamas for the Gaza violence, failed to gain any support from fellow Council members. “Further proof was not needed, but it is now completely clear that the U.N. is hopelessly biased against Israel,” she said in a statement. While the votes were largely symbolic, they offered some insight into the challenges the United States is facing diplomatically over what critics call its unbridled support of Israel’s side in the protracted conflict with the Palestinians. Kuwait’s draft resolution condemned the use of “excessive, disproportionate and indiscriminate force by the Israeli forces against Palestinian civilians” and demanded a halt to such actions. It made no mention of Hamas, which Israel, the United States and several other countries consider a terrorist organization. In the vote for the American resolution, in which the United States was the sole yes vote, three members voted against it and 11 abstained. Previous Post This Factory Was Ready to Expand. Then Came the Trump Trade Wars. When you sign up for a weekly WAKE UP, You can expect to get info on the hot topics of the week, where to go, what to do, who to donate to, who to call with talking points and links to ways to take action and make a difference! We don’t need to search any further for common ground in our country. We have it. We all want the same things – a safe, prosperous, free, democratic nation with opportunity for all. At the same time, we will all be harmed if our democracy, our free press, our Constitution and our core American values are threatened. We will all certainly be harmed if reckless behavior triggers any number of potential armed conflicts. None of us know how this will all play out so let's make a deal. Let’s get up to speed on the issues, establish some facts, take action and watch what happens together . . .